This set of four exclusive vintage style gifts offers you a stunning selection to give to friends and family. 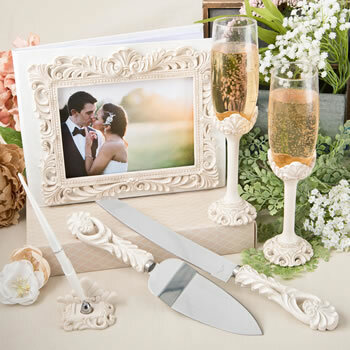 This fabulous gift set offers four fabulous items - A guest book with a photo frame on the front, a set of two toasting champagne flutes, a cake server set and a pen set with a base. The overall design is a stunning vintage look made from poly resin in an ornate flourish design. The poly resin is beautifully hand painted in an antique ivory color with subtle gold leaf accents. The guest book features 50 white lined pages, the blades of the cake set are stainless steel, the flutes are glass and the pen is white plastic. This set offers you a fabulous selection of exclusive items to give as gifts to friends with different tastes! Size of cake server 10.75" x 2" size of cake knife 13" x 1"
Book size is 10" x 8"
Photo front is 5" x 7"
Pen set size is 2 3/4" x 6 3/4"
A fabulous selection of gifts for different tastes!